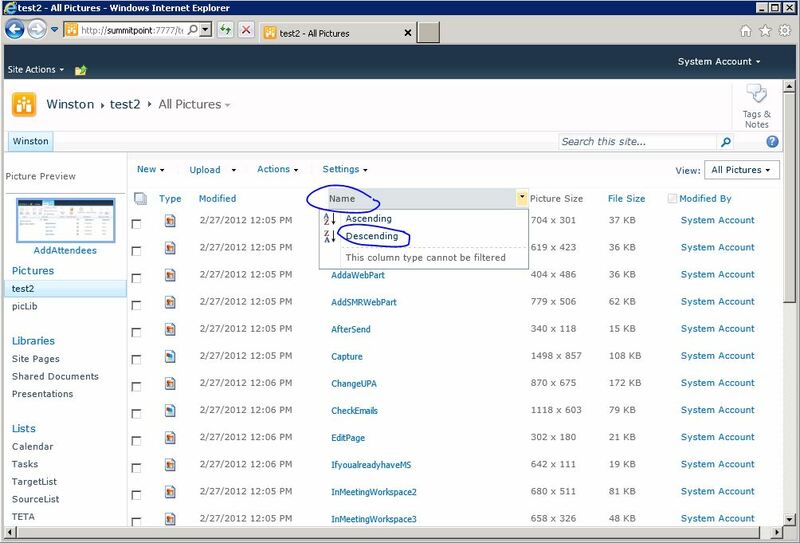 We have a problem for sorting on Picture Libraries in Sharepoint 2010 . I have tested the issue SPS2010 + SP1 + Dec 2011 CU and can be easly reproducable. The problem is when you click “Column” links or click popup window Ascending or Descending links nothing happens .Thats mean you can not able to sort items in Picture Libraries. As far as i know it was working on SP1 level . The problem has occuring after CU upgrade. Does any fix ? Not yet . (12/03/2012) I am expecting but not sure in June CU 2012 will fix the issue. So until then you can use fallowing workaround to fix issue. It is very simple wsp file created as site scope that dispatching postback events on picture libraries by using Jquery. You can download WSP or Source project form Codeplex. Here is the complete sharepoint product version sheet.